KAHULUI – Capt. Kiminobu Kumada of the Japanese training vessel Kaiwo Maru said he would like to “learn some Hawaiian music” and “maybe some songs,” while he and his crew are on Maui to take part in local events commemorating the 150th anniversary of the first Japanese immigrants to Hawaii this weekend. “He plays ukulele, and he likes to sing as well,” said Japanese interpreter and Maui resident Tokie Ogawa. In particular, Kumada and his crew are looking forward to taking in the drumming of Maui Taiko, which will be playing at Maui Matsuri events this weekend. Members of the ship watched the movie “Great Grandfather’s Drum,” an award-winning documentary about Japanese-American culture and plantation life in Hawaii in which Maui Taiko is featured. “I used to play taiko myself,” said Kumada, whose hometown is Tokyo. Kumada shared some light-hearted stories with The Maui News shortly after his vessel with a complement of 165 cadets, officers and regular crew members docked at Kahului Harbor, a little after 9:30 a.m. Wednesday. The ship began its voyage to Kahului Harbor on April 12, departing from from Yokohama. The Kaiwo Maru, shown arriving in Kahului Harbor on Wednesday morning, has a crew complement of 165 members. The Kaiwo Maru, which means “King of the Sea,” has made a port call at Kahului Harbor before. 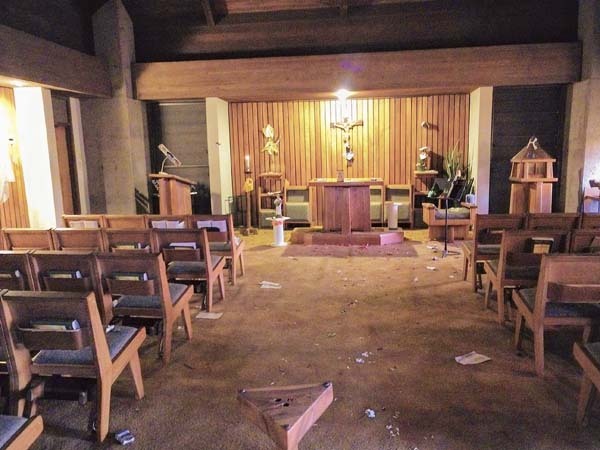 “It’s been 24 years, I hope that we will continue visiting Maui from now on,” Kumada said. In fact, that was the last time a masted tall ship has visited Kahului Harbor, said Duane Kim, Maui District Harbors master. The vessel’s masts rise 164 feet above the water and capture the wind with 18 square sails and 18 fore and aft sails. The ship also has two sets of diesel engines with a total output of 3,000 horsepower that can drive the vessel 13 knots or 15 mph. Many congregating around the harbor to view the arrival of the 361-foot-long Kaiwo Maru had hoped to see the ship arriving under full sail. But Kumada said that the sails will not be unfurled on this voyage. 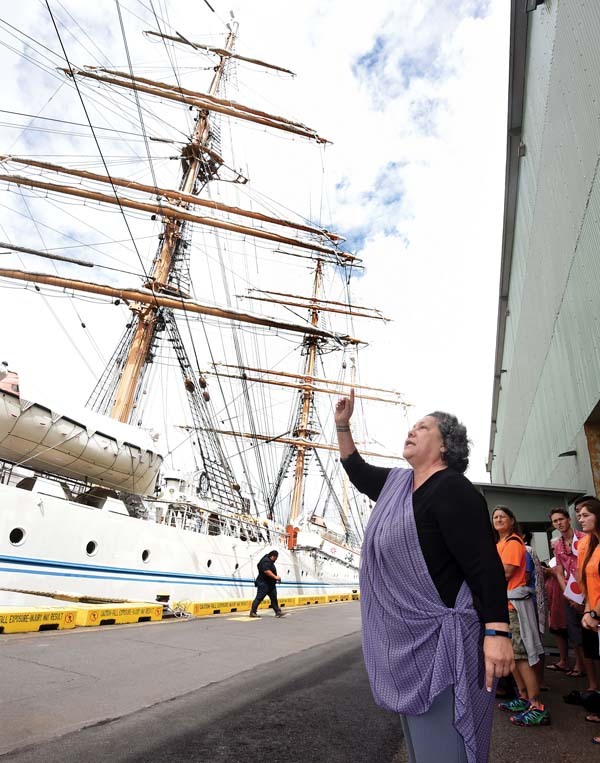 Hokulani Holt welcomes the crew of the Kaiwo Maru with a Hawaiian chant Wednesday at Kahului Harbor. She greeted the ship along with members of the Junior Voyaging Society from Kihei Charter School and Hui O Wa‘a Kaulua. The head office of the Japan Agency of Maritime Education and Training for Seafarer or JMETS has ordered no sails be raised since last month’s death of a cadet, who fell off one of the masts of the Kaiwo Maru’s sister sailing ship, the Nippon Maru, in Tokyo. The accident occurred on the cadet’s first training mast-climbing exercise, part of the process to manually raise the sails, Kumada said. On the sail from Japan to Maui, the plan was to have cadets train on the masts but “plans changed all of a sudden” after the accident, Kumada said. 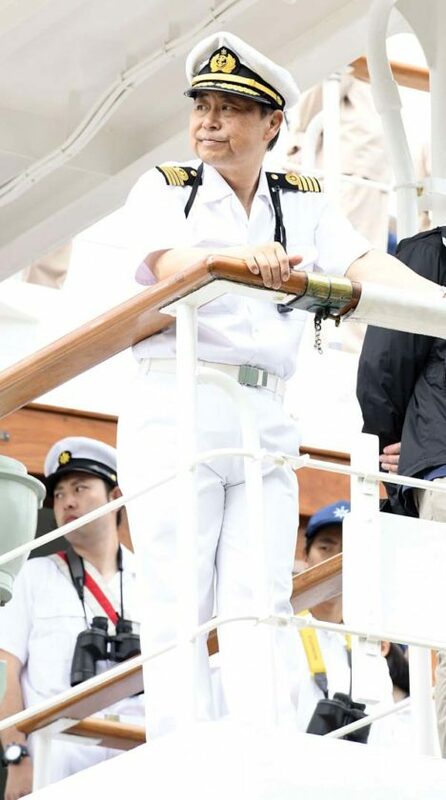 So instead of hoisting the sails and climbing the masts during Saturday’s departure at 4 p.m., cadets will say goodbye while standing on the sides of the ship, Kumada said. 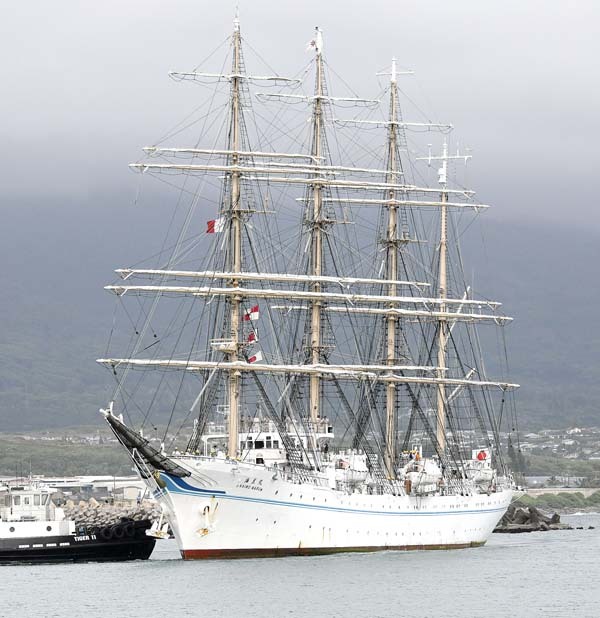 The Kaiwo Maru will travel to Oahu on Saturday before departing May 10 for Vladivostok, Russia. State harbors workers Gilbert Pacheco Jr. (from left), Allen Alejo and Danilo Castres greet the crew of the Kaiwo Maru as it nears Kahului Harbor’s Pier 1 on Wednesday. The ship was designed to be a training vessel and was launched in March 7, 1989. This ship is the second named Kaiwo Maru. JMETS operates two sailing ships, the Nippon Maru and Kaiwo Maru, along with three diesel-powered ships. “This is not a typical ship that you will see in Japan,” said Kumada in the captain’s conference room Wednesday morning, which included chairs with flowing fabric covers and a screen displaying the ship’s coordinates as well as barometer readings. The ship is designed like other ships in structure but is perhaps one of the top five largest tall ships in the world, he said. The training ship includes a mix of manual and automated operations. Manual operations, such as raising of the sails, teach cadets seamanship and bring “the focus or concentration or the harmony, the teamwork,” said the captain. “That’s what they want to learn,” Kumada said. There are 73 cadets enrolled in a navigation course and 32 cadets in an the engineering course. Cadets range from 19 to 25 years old. Training ships used to be only for training of merchant marine cadets but ships like the Kaiwo Maru today are used as a classroom at sea for general youth as well as merchant marine cadets, he said. 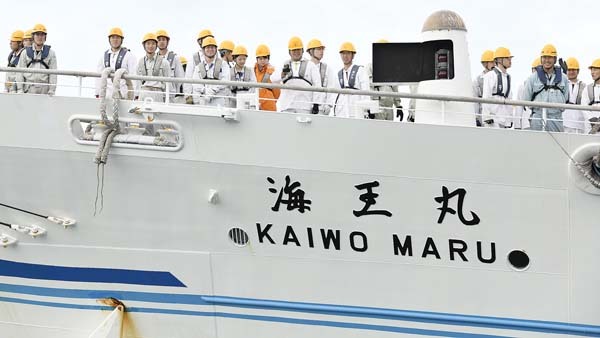 About two hours after the Kaiwo Maru’s arrival Wednesday, the deck was empty and the ship was quiet with just a few crew members moving about. A private welcome reception was held Wednesday evening aboard the ship. 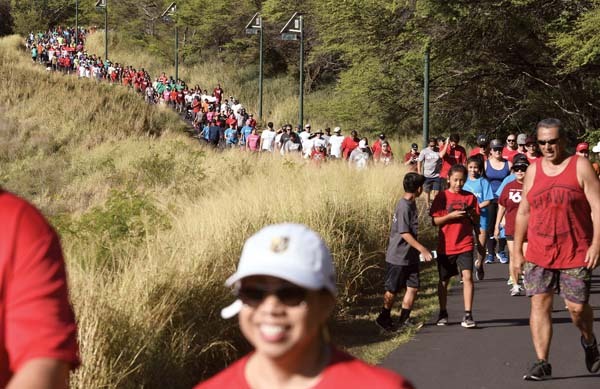 Over the next couple of days, cadets will tour the island, meet and interact with residents at Maui Matsuri events Friday and Saturday at UH-Maui College and learn about the Native Hawaiian culture, Kumada said. Unfortunately, there will be no public tours of the tall ship due to cost and security reasons. Maui’s Ashlyn Melcher gets by a KIHA Geckos player during Maui’s 6-4 win in the 10 under gold final.